RabatAround a million people reside in the capital city of Morocco, Rabat. Rabat is one of the imperial cities of Morocco and boasts many enticing historical monuments and extraordinary places of interest. 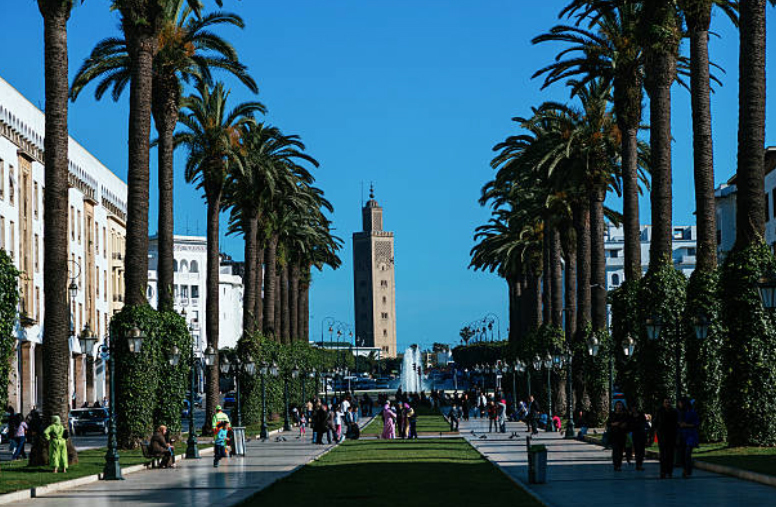 For any traveler exploring Morocco, this city is a great starting point. The city has exotic gardens and interesting museums displaying the Roman ruins. Rabat, with its city gates, magnificent mosques, small back streets, and souks, fascinates any visitor. History RabatRabat has the finest forms of art and culture, making people fall in love with this place. The region is a modern coastal city. The city’s homes and buildings are painted in white and the surroundings have beautiful gardens. In addition, Rabat has quite a few numbers of wide boulevards and is filled with out-of-the ordinary historical monuments and sites. It’s astonishing to believe that some of the sites are very ancient and originated as far ago as the 7th century. The history of Rabat started in the 3rd century BC with a settlement called Chellah on the banks of the river Bou Regreg. Romans conquered Chellah in 40 AD and transformed it into their colony of Sala Colonia. Rome retained the settlement until 250 AD until it was taken over by the Berber monarchs. In 1170, because of its military significance, Rabat obtained the name Ribatu l-Fath, which means ‘stronghold of triumph’. Yaqub al-Mansur, an Almohad Caliph, moved the capital of his kingdom to Rabat. In fact, he constructed the city walls of Rabat and the Kasbah of the Udayas (known as the world’s biggest mosque). But, Yaqub died before the completion of the Kasbah and the remains of the incomplete mosque still stand at present. In 1912, the French occupied Morocco and established the territory. General Hubert, the French officer in charge, made a decision to move the kingdom’s capital from Fes to Rabat. Later in 1956, when Morocco attained independence, Mohammed V the then Emperor of Morocco decided to keep the capital in Rabat. Mausoleum of Mohammed V – this is one of the most significant monuments in Rabat. It’s here that the creator of independent and contemporary Morocco, the father of the nation Emperor Mohammed V is laid to rest. It’s located opposite the Hassan tower. Kasbah of the Udayas – this is the fortification constructed on a mountain, overlooking the ocean. The Kasbah was constructed during the realm of the Almohads. Inside the Kasbah one can come across Andalusian gardens full of orange trees, flowers and palms. The Almohads brought about important transformations to the region of Rabat, including the destruction and rebuilding of the Kasbah, and turning Chellah into a grand necropolis. La tour Hassan – this is the 44 meter high minaret standing tall amongst the remains of the Sultan Yacoub Al Mansour mosque that was destroyed in the 18th century by an earthquake. The construction of this minaret commenced in 1195. However it was never completed. Apart from this, the medina is famous for its great inexpensive food and one can take pleasure to taste the wide range of delicious cuisines.